High Peaks Pure Earth has translated Jamyang Kyi’s third letter to her friend Norzin Wangmo (Nor ‘dzin dbang mo). The letter was orginally written in Tibetan and posted on Jamyang Kyi’s blog on 6th June 2009. Regular readers of High Peaks Pure Earth will be familiar with the friendship between Jamyang Kyi and Norzin Wangmo. The emotionally written first two letters from last year were translated and published here on 5th January 2009. Norzin Wangmo is currently serving a five year prison sentence for sending emails and making phone calls abroad last year. Jamyang Kyi herself was arrested and detained for some time in 2008 and wrote a blogpost full of emotional anguish about her experience, the tones of this experience can also be detected in her letters. Jamyang Kyi mentions Phuntsog Wangyal, one of the most important figures in modern Tibetan history who, as she points out, spent eighteen years in prison starting in 1958. Phuntsog Wangyal’s autobiography ‘A Tibetan Revolutionary’ was originally released in English in 2004 and was translated into Tibetan and published by The Tibet Times in Dharamsala in 2006. Today I am trying to finish the third letter. I know that you are waiting for the letter which should be written in Chinese since all letters must be checked by the jailors. When I realised that the letter will not be passed on to you by the jailors, I started to think of composing a letter which would reach you eventually and it took me some time to prepare this letter. This is the reason why this letter is late. When I wrote my first letter to you, I really did not know how to begin the letter and wondered how you would understand the letter. It was a year after your arrest around 3rd April that I wrote my first letter which contained over a hundred words. The letter was filled with my sadness, the reason is that I could not write all the things I wanted to say and discuss with you, whilst writing the letter I was in tears and could only write some words of encouragement in the letter. A month after sending the letter, I still had not heard any news from you, so I started to think that you may not have received my letter. Then I called your sister to try to find out about your situation. After some days I heard that you had received my letter and we also learned that you are so busy all the time with heavy physical work and you would be punished if you did not finish your work in time. I heard they deprived you of your right to make a phone call to your son Dhondup Dorje once a month. I also heard that in order to regain the right to call your son, now you have been working double time and this has caused you to lose weight. The day we learned that you had received our letters, it was delightful news and immediately I wrote the second letter. I went to Karma Mindru Tibetan Restaurant to look for my niece and tell her to post the letter in the morning. She told me that she had finished her letter to you. My niece met you only once and you two do not know each other well. She knows you because I talk about you. She promised to write to you every month. I am so happy to see her doing this. When I wrote my second letter, I was not as sad as the previous time, yet I was not sure what I should write. It is difficult for me to write something which is artificial in the letter. I know you would not be satisfied if I wrote only a few sentences. At the time I was reading “A Tibetan Revolutionary”, a book about Phuntshog Wangyal and wrote to you about the book. The reason why I mentioned the book to you is that Phuntshog Wangyal spent eighteen years in jail and whilst in prison he read many books, as a result he eventually became a famous scholar. You should learn from his courage and perseverance that will bring great benefits for your life in the future. The punishment given to you by the jailor is an attempt to intimidate you. You should not fall into a deceiving trap and I hope that you will devote yourself to reading books the little time you have. If I were to write a more direct letter, I fear that the jailor would not give you the letter. It is raining today and the weather brings sadness. I remember one time at the end of the autumn, while all the leaves turned a yellowish colour, you with your son, and three members of my family went hiking, when we reached the forest, a (fire) guard prevented us from going further. The children started to play with stones and built the shape of a house. We three adults played a traditional stone game from Ngapa Khyungchu. Do you remember? I remember telling you that I will write down the rules of the game, recently I have started the project along with a collection of folk music of the Ngapa Kyungchu. How come we Tibetans are so unfortunate? All the people who love our nation have been wasted one after another. At the beginning of March this year, Sanggya Dundrup passed away. I thought of writing something about him, but I was unable to as it was so painful. When he was alive, Sanggya Dundrup voluntarily taught Tibetan language to a group of children in Xining and he loved his students. He was teaching on the day he passed away, and this demonstrates his affection for his nation and this is also the legacy he left for us to carry forward. His death is a great loss to his family and to all of Tibet. Palsa la (dPal bzang lags), the place where we played the stone game is exactly located on the hillside which stands behind our office building. From the window of the restroom on the top of the building you can see the mountain range, and every time I recall our meeting my heart pains like a weight of stone pressing on it. The pain in my heart lingers on as this year there are so many sad incidents. In the meantime, I have not found an answer why I always think of you with such deep sorrow. Therefore, it is impossible for me to find a moment of clear mind resembling the pure sky. Since last year I have been taking sleeping pills to calm down my mind and heart. When people ask me to sing a song, I reply to them that I have no reason to sing songs this year. I wrote in my last letter that four years is not a long time to console and give strength to you, nonetheless, I am counting the years on my fingers. Dear friend, it has been a year and two months since your arrest. There is not a single day that passes by without my missing you. i am really touched by the letters of jamyang kyi.it is very hard to imagine the tibetan people in tibet living under threat and fear all the time,we are very lucky to have the basic human right of freedom in western country ,itis our responsibilty to do something for our fellow tibetans in tibet. thanks abu for posting me this blog. I have no word… letter ended but my heart didn't return, it got washed away once again in the thought of my countrymen. 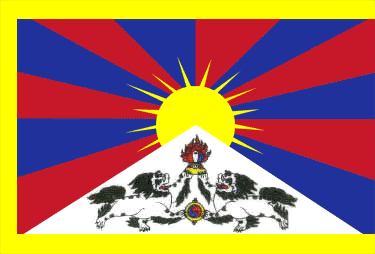 But my prayers went from sky to sky, through the highest peaks and the purest earth of Tibet to extend my solidarity!